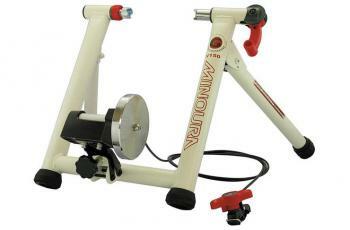 Whether you are just after a spin to get your legs going or a hard training session, the Minoura Gyro V150 wheel trainer should offer everything you ever require in a bike trainer. Right from the box, you can expect high levels of build quality, quietness and stability. It provides a robust, stable and solid platform for effective indoor training. It makes an ideal training tool for the pros and most demanding cyclists. The V150 wheel trainer is packed with the latest Mag technologies by Minoura, with 7 levels of resistance selectable using a remote shifter. Instead of a separate rotor, the ultra-powerful neodymium magnet makes the resistance apply to the flywheel directly. The unit includes a replacement skewer for use with the trainer.